The British defeat at Yorktown doomed the overall British war effort. Throughout the conflict, public support for the war ebbed and flowed, usually in tandem with the news of the combat. On November 25th, 1781, the British War Minister received word of the Yorktown debacle. The British War Minister rushed to inform the British Prime Minister of their loss. The Minister's report was immediately followed by a spirited and highly divided debate in both the British parliament and cabinet. While views differed, no one truly believed the war was winnable at this point. The first attempt at peace-making was made through a letter sent to Benjamin Franklin, in Paris, during the first week of 1782. In the letter, the British offered to accept American independence, if the Americans would make a separate peace with England abandon its French ally. Franklin responded by answering that the US would not abandon France. Franklin was aware that the British were attempting the same tactic with the French. He felt that if the French and the Americans held together they would be much stronger. In February, the British government fell. A new government was formed led by the Marquis of Rockingham, who had been a proponent of peace with colonies, together with the Earl of Shelbourne, who was appointed the new Secretary of State, responsible for the Americas. The American peace commissioners, led by Franklin and Adams, believed this was a government with whom the Americans would be able to reach an agreement. Real negotiations between British and the American began in Paris in April. The British representative was Richard Oswald. At the time, Franklin was the only representative in Paris. Adams was in the Hague. John Jay was in Madrid. 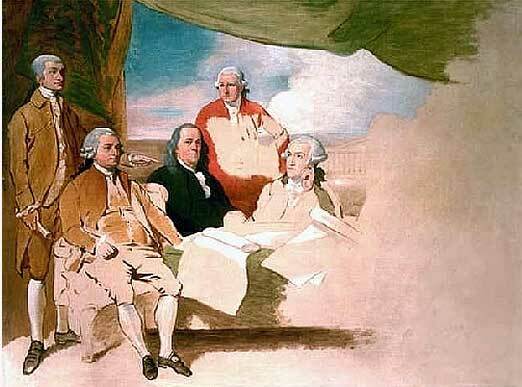 It was clear from the outset that the British would recognize American independence. The questions that needed be negotiated were issues such as: boundaries, compensation to Loyalists and the relationship between the former colonies and Great Britain. Negotiations proceeded swiftly between Franklin and Oswald, so much so that in September Jay, who had joined the negotiations, wrote to Adams and told him to come rapidly to Paris. Adams arrived in October and negotiations moved quickly and were concluded on November 29th, when an agreement between the United States and Great Britain was signed. The Americans achieved all their goals. American independence was recognized and American territorial claims up to the Mississippi was recognized. US acess to offshore fisheries was even included. In return, the only thing the United States agreed to was to recognize their pre-war debt to British citizens, and not to persecute former Loyalists. The treaty was to take effect as soon as both the French and Spanish also reached peace agreements with England. In the beginning of January they too reached agreements with England. On April 9, 1783, General Washington was able to give the order to his troops to stop â€œall acts of hostilityâ€. The last British outpost in North America was in New York. While much of the Continental Army slowly disbanded, Washington remained North of New York with a skeletal army. On November 25th the last British troops boarded ships in New York harbor and Washington marched into Manhattan. The war was now truly over. The Americans had achieved what was thought to be impossible- Independence.